Physiotherapist Emma Esslemont recently discovered the huge benefits of getting a Dexa Scan at Body Measure in Crows Nest. Mainly, she loved the fact she was given perspective and direction as to what is needed to be ‘healthier’. She also asks the question: If you knew you were at higher risk of developing chronic disease would you change your lifestyle? Last weekend I went and got a DEXA Scan & it was probably the most interesting & worthwhile $85 I have spent in a long time. Chronic disease is literally taking over the world. If it’s not heart disease its diabetes or cancer; obesity or depression. It’s all around us and it’s pretty scary. This really hit home recently for me following a conversation with my mum. My parents are in their mid 60’s and both have had a pretty clean bill of health. Many of their close friends however have not been so fortunate. In the last 6 months my godfather passed suddenly from a heart attack (he had underlying heart disease), my godmother is battling breast cancer and another close family friend recently found out she had a brain tumour. Bad things happen in 3’s so I have my fingers crossed that that’s the last of the bad news. 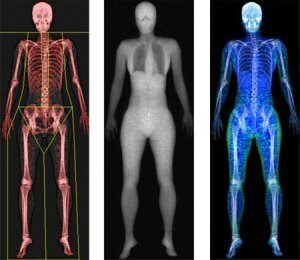 A DEXA scan is the most accurate test to measure our body composition and bone density. Our bodies are comprised of fat, bone, muscle and of course our vital organs. In the past body mass index (BMI) has been the measure of choice in the medical world. This uses your weight and height to calculate whether you are normal, overweight, obese or morbidly obese. The shortfall of this is that people who have a lot of muscle such as sportsmen & athletes were falling into the obese category because it doesn’t account for differences in muscle mass and fat mass. The DEXA scan addresses all of this allowing an accurate measure of body fat, lean muscle and bone density. It takes out ‘water weight’ (the mass of our bladder and bowel) and also is capable of breaking down measurements into different regions. This is particularly important medically as higher levels of visceral fat in the abdominal region (yep I’m talking beer bellies and muffin tops) is a huge risk factor for many chronic diseases such as heart disease, type 2 diabetes and stroke. Doctors, personal trainers and nutritionists can then use this information to implement prevention strategies into one’s lifestyle. People with lower bone density will benefit from weight bearing & resistance exercises to strengthen the bones while people with high visceral fat may need to address certain aspects of their diet. Considering that the fitness industry is BOOMING at the moment; there’s boot camps, running groups, gym franchises popping up EVERYWHERE we really don’t seem to be getting any healthier. Australia is one of the ‘fattest’ nations in the world! I honestly believe that it’s because so many of us are not aware of our unhealthy we really are. Health and wellbeing isn’t as simple as exercising every day, sure this helps (and I highly encourage it) BUT many other aspects need attention, especially diet and nutrition. Having this scan, and having a visual image of my body composition which is then mapped against normal values for my age group gives you a little perspective and also gives you direction as to what you need to do to be ‘healthier’. If you knew you were at higher risk of developing chronic disease would you change your lifestyle? It’s $85 that could quite literally save your life.